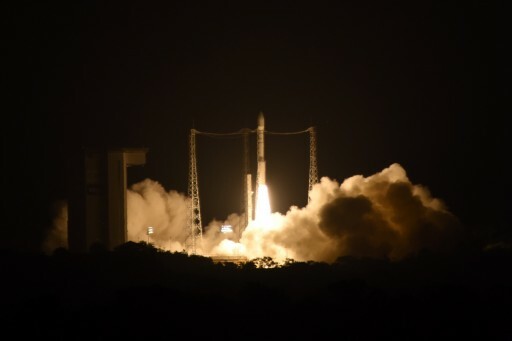 ESA’s LISA Pathfinder embarked on a critical demonstration mission on Thursday, making a thundering blastoff atop a Vega rocket launching from the ZLV launch site at the Guiana Space Center for a trip to Low Earth Orbit. 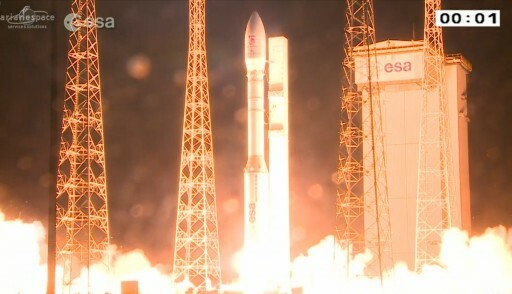 Blastoff occurred at 4:04 UTC and Vega’s three solid-fueled rocket stages fired for six and a half minutes followed by a 100-minute flight of the AVUM upper stage that fired twice to deliver the 1,900-Kilogram LISA Pathfinder to an elliptical orbit from where it will start its journey. Starting its long odyssey in a Low Earth Orbit peaking at 1,500 Kilometers, the LISA Pathfinder is set for a few days of testing controlled from the European Space Operations Center before the mission can head into a series of orbit-raising maneuvers using its own propulsion system. 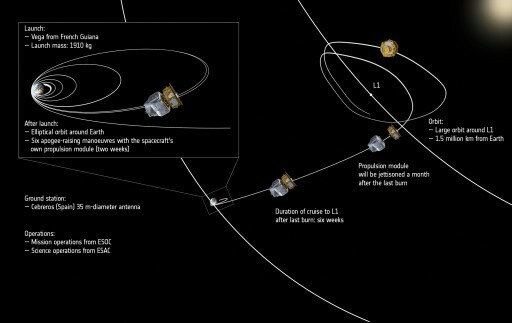 Making six propulsive burns to gradually raise its orbit, the LISA Pathfinder will eventually depart Earth orbit to head to the Earth-Sun Lagrange Point 1 located 1.5 million Kilometers from Earth. There, the craft can conduct its ambitious demonstration mission focused on the most accurate distance measurement system ever deployed to space along with innovative micro-thrusters that control the spacecraft’s motion with nano-meter precision. The LISA Pathfinder is a precursor to the eLISA mission (Evolved Laser Interferometer Space Antenna), testing out critical technologies needed for the most accurate distance measurement ever carried out over astronomical distances. 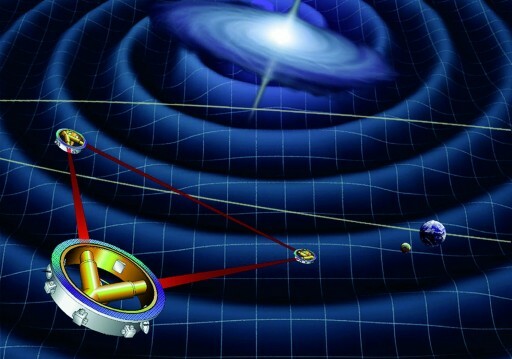 The goal of the eLISA mission is the detection and measurement of gravitational waves – ripples in space-time moving at the speed of light, caused by massive celestial events. Predicted by Einstein’s Theory of General Relativity, gravitational waves can be measured by studying perturbations in the orbit of a constellation of satellites that are kept at a reasonable distance in order to sequentially encounter the gravitational wave front. 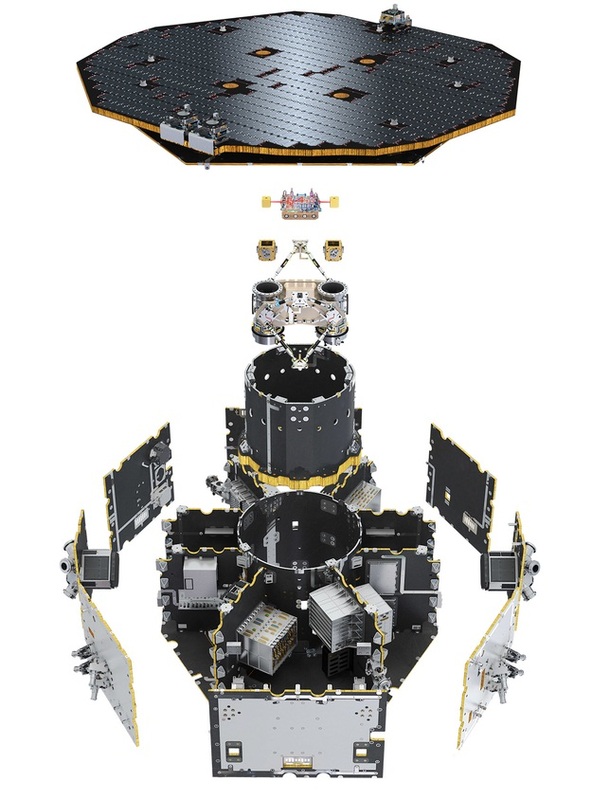 To accomplish this ambitious measurement, eLISA will deploy a three-spacecraft constellation – forming a triangle in an orbit around the sun with each side length measuring one million Kilometers. Each spacecraft will contain a pair of test masses that are kept in perfect free-floating conditions by a Micro-Thruster System that counteracts any external influences to essentially keep the spacecraft flying around the proof mass in its cage. A laser interferometer (distance measurement system) will be employed to keep track of the distance between the test masses of opposite spacecraft at an accuracy of a few picometers (!) in order to detect passing gravitational waves. 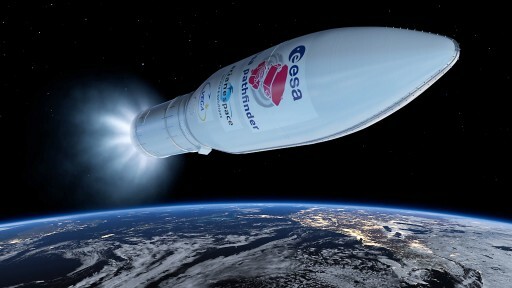 Given the scope of the eLISA mission and the involved financial effort, ESA decided to perform a shakedown mission to demonstrate the two key technologies of the eLISA spacecraft – the laser interferometer system and the micro-thrusters needed to keep the spacecraft flying ‘around’ the free-falling test mass. These technologies are demonstrated by basically shortening the one-million-Kilometer arm of eLISA to just 38 centimeters to fit two test masses into a single spacecraft and measure their distance. 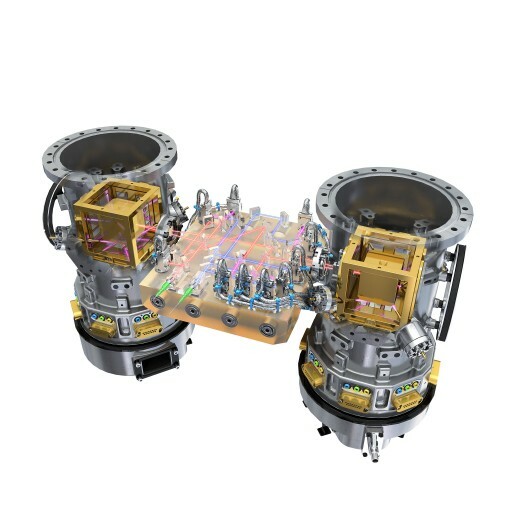 Naturally, with this setup LISA Pathfinder will get nowhere close to detecting gravitational waves, but the overall measurement scheme and accuracy can be verified, as can the complex control technique that keeps one of the two masses free floating in its small gold-molybdenum cage. The two gold-platinum test masses can be positioned within their enclosures using electrostatic forces between electrodes and the same system can be used to make a capacitive measurement of mass position while the distance long the sensitive x-axis is measured by the laser interferometer. To achieve an accuracy of 10 picometers, the system is comprised of four different interferometers, one for the distance measurement, and three for calibration and drift correction. The collective system of test masses and laser interferometer is known as the LISA Technology Package. 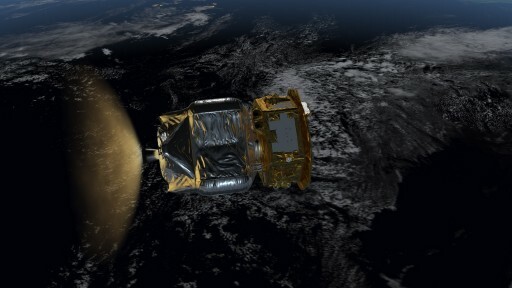 Two MicroThruster Packages are part of the LISA Pathfinder, one designed in Europe and one from NASA under the New Millennium program’s downsized Space Technology 7 test. The Cold Gas Micropropulsion System uses 12 small nitrogen thrusters with excellent thrust control in the micro-Newton range while NASA’s Disturbance Reduction System hosts electrospray thrusters. Both propulsion systems can control the spacecraft’s orientation to a few nanometers based on readings of proof mass position and required angular rate change provided by the LISA Technology Package. 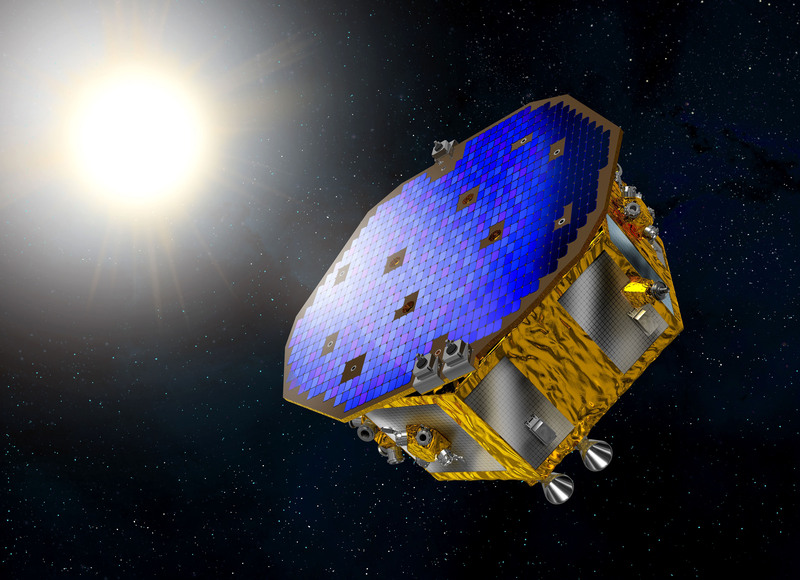 For LISA Pathfinder to be able to conduct its demonstration measurements in a realistic environment, a quiet place in space was chosen for the mission – the Sun-Earth L1 Lagrange Point located 1.5 Million Kilometers closer to the sun on the Earth-Sun axis. There, LISA Pathfinder receives constant sunlight and orbits in a stable gravitational environment with very little disturbances. If the mission goes according to plan, LISA Pathfinder is due to arrive in its Lissajous orbit around L1 in late January to begin a half-year mission putting the LISA Technology Package and the Micro-Thrusters to the test. Countdown operations for Thursday’s launch picked up for the spacecraft nine hours ahead of the expected T-0 time, after the all-clear was given from the launch vehicle side announcing the successful conclusion of reviews looking at concerns regarding the thermal environment the engine of Vega’s Upper Stage would experience during the extended coast phase of the mission. With all issues closed out, the team at ESOC began monitoring the LPF spacecraft beginning at L-9 hours and also pressing into final battery charging and conditioning. 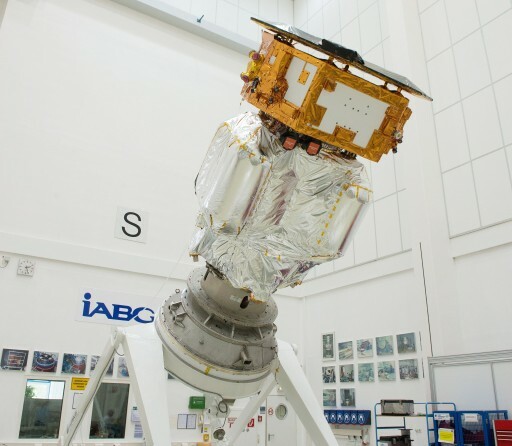 Around the world, ESA Tracking Stations were configured for an extensive network test to ensure data could flow to and from ESOC from all stations on the primary and backup channels to ensure good connectivity with LISA Pathfinder after launch. At the ZLV launch site, Vega countdown operations kicked off eight hours ahead of launch with a verification of downrange tracking stations that were called up at the start of the countdown. The team was also given a series of weather briefings, receiving good news as meteorologists were forecasting favorable conditions for launch from French Guiana. Inside L-6 hours, teams activated the Multi-Function Unit aboard the AVUM upper stage that facilitates the Guidance, Navigation and Control system of the Vega launcher. Also, Vega’s transmitters and the inertial navigation system were powered up to start an extensive series of tests to ensure all avionics were functioning properly. The vehicle’s Safeguard Master Unit was also activated and the times of onboard and ground master sequencers were synchronized for subsequent countdown operations. 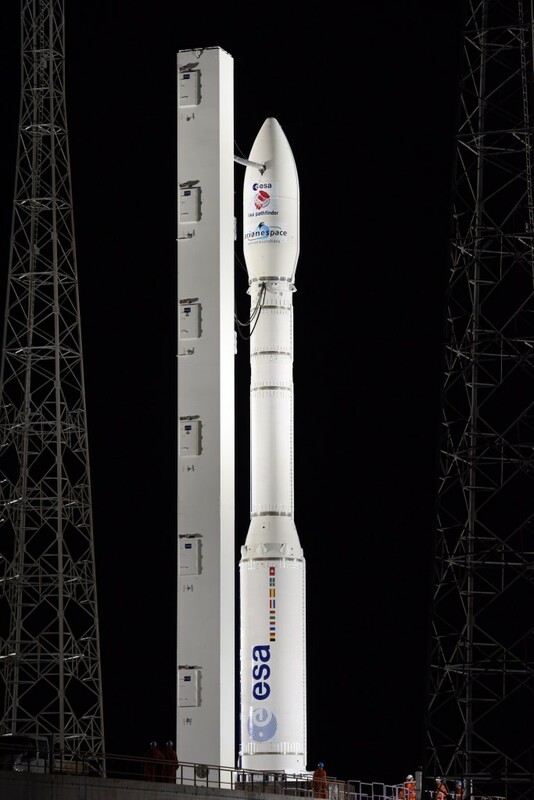 Overall, the Vega launcher stands 29.9 meters tall and weighs 137,000 Kilograms at liftoff using three solid-fueled rocket stages with a bipropellant upper stage consuming storable propellants. 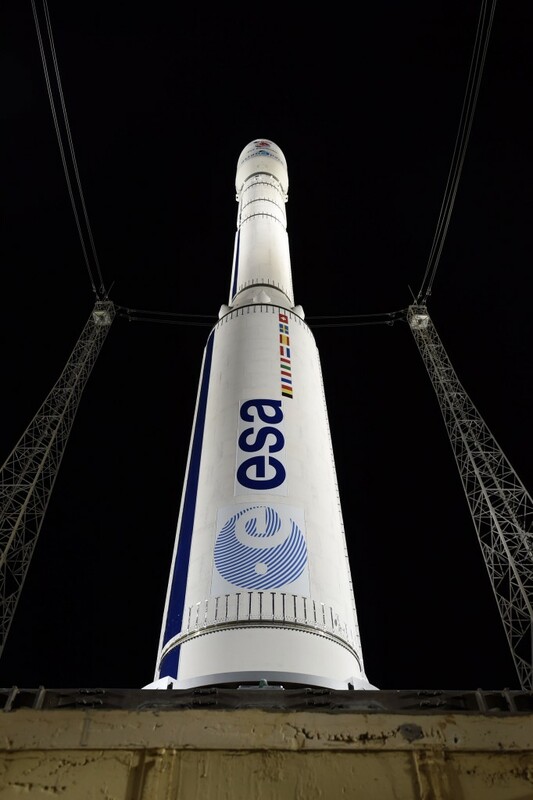 Without any cryogenic or large liquid-fueled stages, Vega’s countdown does not include dynamic events such as propellant loading. With initial checkouts complete, the launch team powered off some of Vega’s systems while teams at the launch pad completed final hands-on work. Final operations at the pad included close-outs of the Vega rocket and the retraction of access platforms, clearing the way for the rollback of the Mobile Service Gantry that started at around L-3 hours. It took about 45 minutes to move the large gantry that was used to assemble the Vega launcher to a safe distance for liftoff. With the gantry gone and Vega exposed on its pad, the launch team re-activated the vehicle’s transmitters and transponders. Radar transponder interrogation was completed as part of range safety checks that verified that the Flight Termination System was operational. Extensive electrical checks, flight software load and control system verifications were completed as the countdown entered its final hour. By T-34 minutes, teams had finished preparations for the Synchronized Sequence. At ESOC teams were able to verify the full readiness of all ground stations and the health of the LISA Pathfinder, signaling their final GO for liftoff at L-25 minutes. LISA Pathfinder made its transfer to internal power at L-15 minutes, marking its transition to launch mode. Heading into the Synchronized Countdown Sequence at T-4 minutes, Vega started a precisely choreographed procedure including the final steps necessary to configure the vehicle for flight. During these final four countdown minutes, Vega switched to battery power, armed its Flight Termination System and made the transfer to onboard control. The payload fairing purge supply was turned off and Vega underwent a thrust vector control system test on its first stage to ensure good control after liftoff. After a final automatic verification of systems readiness, Vega’s computers issued the ignition command. Vega thundered off at precisely 4:04:00 UTC when its powerful P80 first stage ignited and catapulted the rocket off its pad with a total thrust of 231 metric ton force. Making its fast initial climb, Vega headed straight into a wall of clouds before initiating its pitch and roll maneuver, taking the vehicle almost due east for a flight across the Atlantic Ocean, targeting an equatorial orbit. 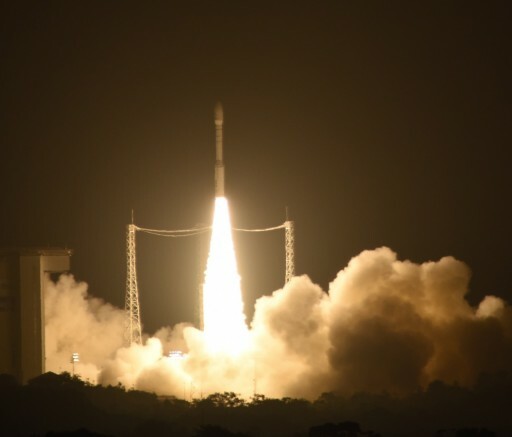 Vega quickly climbed uphill into cloudy skies over French Guiana, passing the speed of sound 34 seconds after liftoff followed 20 seconds later by Maximum Dynamic Pressure. The launcher burned 820 Kilograms of propellant per second at that stage of the flight. The P80 FW rocket stage measures three meters in diameter and 11.2 meters in length loaded with 88,365 Kilograms of propellant. P80 burned out one minute and 50 seconds into the flight followed by the initiation of staging at T+1:53 as Vega fired cutting charges to separate its first from the second stage at an altitude of 49 Kilometers. Small retrorockets pulled the empty first stage away from Vega allowing the Zefiro 23 rocket stage to ignite. Providing a thrust of 121,960 Kilograms, the Zefiro 23 rocket motor continued powered ascent. At a length of 8.4 meters and a diameter of 1.9 meters, the second stage held 23,906 Kilograms of propellant at liftoff – 300 Kilograms of solid propellant were consumed per second once the second stage was lit. Executing a perfect burn, the Z23 stage started tailing off at T+3 minutes and 10 seconds when Vega was over 100 Kilometers in altitude, traveling 4.0km/s. Just under half a minute after Z23 burnout, the connection between it and its smaller companion, the Zefiro9, was cut and Z23 moved out of the way for third stage ignition three seconds after staging. 15 seconds into the burn of the third stage, Vega jettisoned its 7.6-meter long payload fairing, exposing the 3.5-meter tall LISA Pathfinder spacecraft and the AVUM Upper Stage for the rest of the way into orbit. The third stage has the longest burn time of Vega’s solid-fueled stages, providing 22,940 Kilograms of thrust and burning through 92 Kilograms of propellant per second. The Zefiro 9 stage is 4.1 meters in length with a diameter of 1.9 meters. Concluding its burn of 112 seconds, the Z9 stage had consumed 10,115kg of propellants and accelerated the stack to a speed of 7.1 Kilometers per second. Vega held onto the third stage for another 50 seconds to ensure a complete thrust-tail off ahead of separation to avoid re-contact between the stages. Separation of AVUM was confirmed six and a half minutes after launch and the upper stage immediately started to use its Nitrogen Cold Gas Thrusters to enter the appropriate orientation for its first main engine burn. Beginning seven minutes and 39 seconds into the flight, the AVUM ignited its RD-869 main engine that uses hypergolic propellants to generate 250 Kilograms of thrust. AVUM, the Attitude and Vernier Upper Module, is 2.18 meters in diameter and 2 meters long holding a total of 550 Kilograms of Unsymmetrical Dimethylhydrazine and Nitrogen Tetroxide Propellants. The AVUM also houses the vehicle’s control system that is in charge of controlling all four stages of the launcher. The first burn of AVUM had a duration of close to nine minutes, being dynamically adjusted by the upper stage to fly out any errors occurring with Vega’s injection as solid-fueled vehicles are a little less accurate and liquid engines. After shutdown of AVUM, the stack entered a preliminary trajectory with an apogee at 1,1165 Kilometers, entering a coast of one hour and 25 minutes to reach the proper position for the second burn in order to achieve the target equatorial orbit with the proper apogee placement – already targeting the departure of Earth Orbit to be completed later on. Making almost one entire lap around the planet, AVUM re-started its engine one hour and 41 minutes into the flight for a burn of just 94 seconds aiming for an insertion orbit of 207 by 1,540 Kilometers at an inclination of 5.96°. 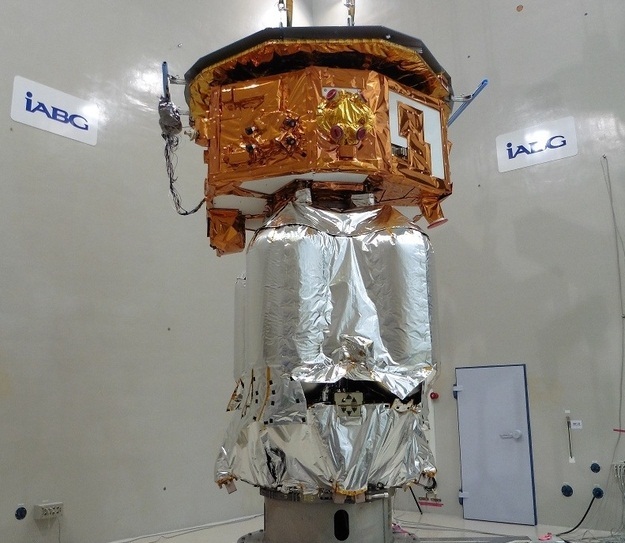 At the completion of this burn, AVUM began a re-orientation maneuver to release the LISA Pathfinder at a pre-defined attitude optimized for power generation and communications with the ground. 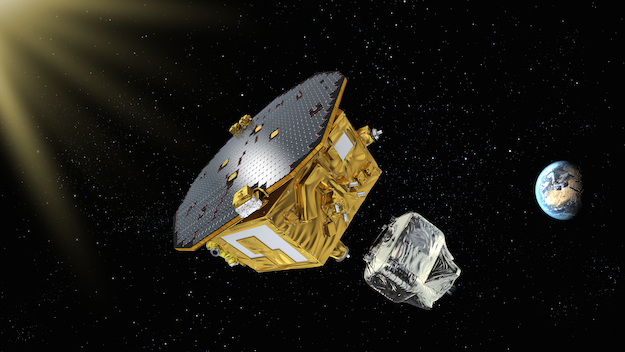 Separation of the spacecraft was confirmed one hour and 45 minutes after liftoff, marking the first step for LISA Pathfinder in a very long journey taking it 1.5 million Kilometers to its orbital destination to prove the technology that will eventually open up a new window to the universe when flying with eLISA. 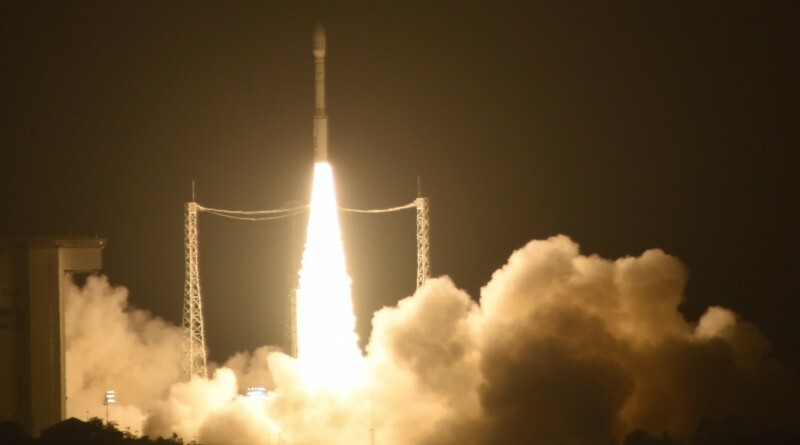 One minute after separation, LISA Pathfinder activated its communications system to initiate contact with the ground station in Kourou that was tasked with the initial acquisition of the spacecraft. Signals from the vehicle arrived on time, confirming that the spacecraft was healthy after arriving in orbit. Teams quickly confirmed a health status across the core systems of the spacecraft and issued a test command to see whether it would be received and executed by the spacecraft. 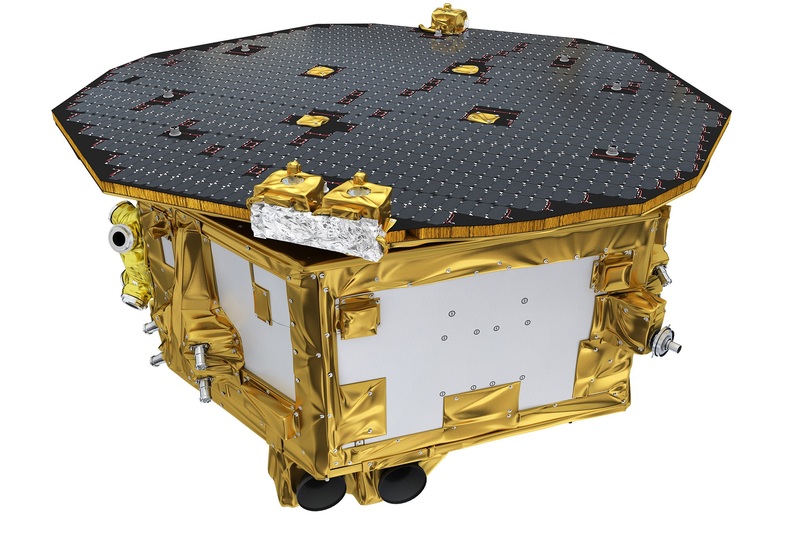 With no issues, LISA Pathfinder continued its 16-minute automatic sequence during which it acquired a stable sun-pointing attitude and primed its propulsion system. Confirmation of sequence completion arrived when LP was picked up by the Malindi Ground Station in Kenya. With a successful launch, the team at the European Space Operations Center can take control over their spacecraft for a Launch and Early Orbit Operations Phase lasting three days. This operation includes a detailed set of checkouts of the various spacecraft systems to ensure LISA Pathfinder is ready to depart Earth. A calibration firing of the craft’s 400-Newton main engine will be performed on the third flight day to gather data for the planning of the six orbit-raising maneuvers. Given the limited performance of the 400-Newton liquid-apogee motor of the Propulsion Module, six firings will be needed to gradually increase the apogee altitude of the Earth-centered orbit over the course of two weeks. The final burn of the Liquid Apogee Engine will deliver the LISA Pathfinder spacecraft to an L1 transfer trajectory in which it will coast for six weeks before arriving at its destination for a mission of at least six months. Thursday’s launch was the sixth launch of Vega and final in the launcher’s VERTA certification program, allowing Vega to graduate to the rank of operational rocket.